We all know by now he missed a couple of days of training with a slightly elevated white blood count, but he never missed an oat and has been back to the track showing great energy. Remember, he did travel cross-country, ran in the Florida Derby, and immediately traveled to Kentucky. Sometimes the stress of traveling, racing, and traveling again right after the race can knock a horse’s blood count off a bit. The bottom line is that he’s settled in at Keeneland and is back in his normal routine. His followers had to be thrilled to see Exaggerator’s monster performance in the Santa Anita Derby, considering Nyquist has beaten him three times. Add that to the four times he’s beaten his stablemate Swipe, and you can see why Nyquist is trainer Keith Desormeaux’s worst nightmare. He keeps improving his stock whether he runs or not, and now it’s just a question if he is ready to win the Kentucky Derby off such a light racing schedule. He would be the first horse in memory to win off one sprint and one two-turn race. I wasn’t comfortable putting any horse above him in the top spot; that is until the Santa Anita Derby. Now I have some serious thinking to do in the few remaining weeks. Some question his ability to get 1 1/4 miles, but remember, Uncle Mo’s broodmare sire is the stamina influence Arch, Uncle Mo’s best horses all look like they want to run long, and Nyquist’s female family has major stamina influences Pleasant Colony, His Majesty, Seeking the Gold, Buckpasser, and Arts and Letters, so he traces to Ribot twice. Just as a point of interest, all those stallions mentioned also are superior wet-track influences. As a big fan of this horse since day one, the temptation was great to make him No. 1, but I couldn’t quite pull the trigger, at least until I see his Thoro-Graph figure to make sure it’s not some outrageous through-the-roof number. Will I get up the nerve next week to actually put him ahead of an undefeated champion who’s already beaten him three times? Sounds crazy, I know, but stay tuned. I admit I have some dinosaur in me and am just a believer in the traditional way of preparing a horse for the Derby. I’m still not quite sure what we’re dealing with. Is Exaggerator simply a superior mudder or has he been transformed into some electrifying dynamo of a horse thanks to a major change in running style? We’re talking Jekyll and Hyde transformation. No matter which one, give a lot of credit to Keith Desormeaux for trying something so dramatic, most trainers wouldn’t be able to pull it off. In fact, I’ve never seen one do it to this extent before. For those who think it’s the slop, yes he’s run well in the mud before, but a neck victory in the Delta Jackpot and a second in the Breeders’ Futurity are a far cry from the freakish performance he turned in Saturday. I commended Desormeaux last year for going old school and starting Texas Red off in a 7-furlong sprint, and he did the same thing this year with Exaggerator, as did his nemesis Nyquist. But Exaggerator has had a more conventional prep schedule since. Exaggerator’s turn of foot in the Santa Anita Derby was so explosive and he was moving so fast turning for home on that wet slick track, he looked like a speeding dune buggy negotiating a turn on its side wheels and in danger of tipping over. The stunning visual aspect of Exaggerator’s win aside, let’s look into why he was able to make that kind of run as if moving in a different time frame than the other horses. First off, unlike the San Felipe, Danzing Candy’s suicidal pace of :22, :45 1/5, and 1:10 1/5 set it up for such an explosion from the back of the pack. Second, the :39 3/5 final three-eighths suggested a total meltdown of all those within three or four lengths of the leader. To his credit, however, he went from the half-mile pole to the eighth pole in a rapid :47 2/5, and didn’t need to go any faster than the :13 1/5 it took him to come home his final eighth. And his Beyer figure of 103 was faster than anything we’ve seen so far this year. This horse has had his share of detractors who felt he was distance limited. But he is by Curlin and his tail-female family traces to English and Irish Derby winner The Minstrel and Greentree’s Belmont Stakes runner-up Ruritania, a son of major classic/stamina influence Graustark. Well, I stuck with Brody’s Cause at either No. 2 or No. 3 for nine weeks waiting for his debut in the Tampa Derby, but it took him another four weeks after that to finally run the way I’ve been expecting him to. Was it his love of Keeneland or is this what we’re going to see at Churchill Downs? He only earned a 91 Beyer, but his :37 2/5 final three-eighths was excellent. It should be noted, however, that with a solid :46 3/5 opening half, the first three finishers were able to close from 11th, 13th, and 10th, respectively, with pacesetter Laoban running a sneaky good race to hang on and finish fourth. Brody’s Cause’s final eighth in :12 4/5 was just OK, but none of the 3-year-olds in general seem to be coming home all that fast this year. He has won going a mile at Churchill Downs, and remember my original Derby gods angle of Dale Romans being the chosen one this year. Then again, Romans also finished third with the improving late closer Cherry Wine, and has Unbridled Outlaw in Saturday’s Arkansas Derby. So that angle looks to be back on the table. Amazingly, the last Blue Grass winner to capture the roses was Strike the Gold back in 1991. It’s funny how the race was a much more successful prep when it was run nine days before the Derby. Brody’s Cause is inbred three times – to a Kentucky Derby winner, an English Derby winner, and a Belmont Stakes winner, and there is no question of him getting the mile and a quarter. He turned in one of the better works of the year, drilling 7 furlongs in 1:24 3/5, as Baffert focuses on sharpening him up while building up his stamina. That is the one thing we don’t know about him; how effective he’ll be at 1 1/4 miles. From a speed figure standpoint, his Rebel Thoro-Graph figure was slow in comparison to the runner-up, Whitmore, who covered much more ground and actually had a figure 3 1/4 points faster than Cupid’s, which is pretty startling to have a runner-up run that much faster than the horse who beat him 1 1/4 lengths. With that said, take away the speed figures and go by the eye test and what Cupid accomplished coming off a maiden victory, and you have to believe he is going to improve as much if not more than his beaten foes, and that what we saw in the Rebel was only the tip of the iceberg. I would expect to see Cupid rate back off the pace this time, as he did in his maiden victory, and improve his speed figure significantly. Remember, his Beyer figure of 95 was right up there with the best of this crop of 3-year-olds, and I expect him to top that, so perhaps the two speed figures are a wash, depending on which ones you choose to follow. Once again, there are plusses and minuses to take from his second in the Santa Anita Derby. The positives are that, with his big stride,. he didn’t seem all that comfortable in the slop, and he was not hard ridden in the final furlong, yet still kicked in late to get second. But again he did not show any acceleration until the sixteenth pole, and Exaggerator roared by him on the turn like he was moving in slow motion. To look at his chances in Kentucky optimistically, he has run well in the slop at Churchill Downs, he will appreciate the 1 1/4 miles, and this race, on the surface, didn’t seem to take a lot out of him. In the San Felipe, he ran his half-mile and three-quarter fractions in :47 1/5 and 1:11 3/5, but in the Santa Anita Derby, he went in :46 flat and 1:10 4/5. That is faster than he wants to go, and he won’t go anywhere near that fast in the Kentucky Derby. Also, his race reminded me in a way of Real Quiet’s second-place finish in the Santa Anita Derby. He was no match for his brilliant stablemate Indian Charlie, but he did run on even terms with him in the final furlong, despite not being persevered with and being allowed to close on his own by Kent Desormeaux once he saw he was beaten. Mor Spirit was 6 1/2 lengths behind Exaggerator at the eighth pole and 6 1/4 lengths behind him at the finish, also being allowed to finish on his own when Gary Stevens saw he was beaten. Real Quiet would go on and prove to be the better horse at 1 1/4 miles, and that is what Bob Baffert is counting on. As I mentioned last week, you can’t wait until the sixteenth pole to kick into gear like this colt does, because the vast majority of horses in front at the eighth pole in the Derby do not come back to you. He doesn’t have a big turn of foot, so he needs to get in gear earlier to put himself in better position to win, and he has a better chance of doing that from the second tier to mid-pack in the Derby. But the feeling here is that he needs to be within one-to-two lengths of the lead at the eighth pole. Things are never cut and dry anymore and traditional training regimens are slowly disappearing, and as a result I’m totally confused what to do about this colt. Because the connections are so closely associated with the Ragozin Sheets, I can understand their fears and concerns about such an early peak performance. You sure can’t knock the form of the Tampa Bay Derby, with beaten horses Outwork and Brody’s Cause winning the Wood Memorial and Blue Grass Stakes, respectively. Why the change to such an unorthodox schedule? Checking the 33 years of Thoro-Graph figures, no Derby winner has ever run a negative number at 3 as early as March 12, as Destin did. In fact, the only Derby winner to have run a negative number two starts before the Derby was Smarty Jones, who bounced two points from the Rebel to the Arkansas Derby, then was great enough to pair up at Churchill Downs. So, as big speed-figure guys, you can imagine the curve ball Destin’s owners were thrown when they saw his Tampa Derby figure, and most important the gigantic jump he made from anything he’d ever run before, which was even more alarming than the figure itself. Making such a dramatic move and running that fast a number, it put them in a very precarious position, and it basically looks as if by shutting him down until the Derby they have chosen the lesser of two evils, which is trying to win the Derby off an eight-week layoff and never having been farther than 1 1/16 miles, both unprecedented in modern times. Having another race before the Derby could totally knock the horse out, but this way, even if he comes up short in the Derby, they will at least have a horse for the Preakness and/or Belmont, as opposed to not having a horse at all for the rest of the Triple Crown. That is why it is so difficult knowing where to rank this horse. He may be as talented as any of them and has all the tools to win the Derby, but he also is a classic example of a horse peaking too soon and having his entire Derby preparation altered just to get him to the race with some sort of fighting chance. Because of his talent and pedigree, and how much I like this colt, I still have to give him some kind of chance of winning the Derby even with the odds he’s up against. Just remember, the next time you complain about a 3-year-old running slower figures in February and March, look at Destin and consider the alternative. Guess what? We have positives and negatives to sort out. What else is new? Whether or not this colt is ready to win the Derby off only four career starts, what he has accomplished in a short period of time has been pretty remarkable, and after his last two starts, he has gained the experience of a seasoned veteran. Even though he’s had only four starts, two of them have been in sprints, and his first race was way back on Apr. 23 of last year in a 4 1/2-furlong race. So, in essence, he’s really coming into the Derby off only three starts. So, just think of a horse with such little experience and seasoning stretching out to two turns for the first time in the Tampa Bay Derby and pushing his stablemate Destin to a track record and a 100 Beyer figure, while finishing seven lengths ahead of the third horse. Then, stretching out again to 1 1/8 miles in the grade I Wood Memorial on a tiring, sticky, muddy track, he breaks from the outside post and goes four-wide into the first turn before hooking up with the speedy Matt King Coal and dueling through swift fractions of :22 4/5 and :46 3/5. Outwork wasn’t able to shake free of Matt King Coal until he eased clear at the quarter pole with his ears pricked. Although it was obvious he was tiring in the stretch, he was able to dig down and gamely hold off the challenge of California invader Trojan Nation, who looked like the stronger of the two at the sixteenth pole. But he would not let him get by. Yes, he beat a maiden, who had never even finished second in five career starts, and they crawled home in :40 3/5 for the final three-eighths and :14 for the final eighth, and the time of 1:52 4/5 was the slowest Wood ever and slower than the Gazelle Stakes the same day. Part of that slow final eighth no doubt was Outwork seemingly goofing off a little with his ears straight up. There is a historical look at the slow time in Knocking on the Door. Those were the negatives, but the bottom line is that this colt has crammed so much into two starts off practically no racing foundation and has been forced to become a man in a hurry, being subjected to very fast and very slow races, head to head battles, and handling a quirky surface like Tampa and a quagmire at Aqueduct, which should help give him a good deal of bottom and toughen him up for what will be an arduous assignment on May 7. He turned in a strong 5-furlong breeze in 1:01 and galloped out strongly in 1:14 1/5. I probably dropped him too far down, but things will change over the next couple of weeks. He is another who has looked impressive visually in his two stakes victories at Fair Grounds, but has been running slow figures and beating questionable competition, so we really have no idea how good this colt is. His Thoro-Graph figs have been steady all through his career, but need to get faster by at least several points. He is from one of the successful Ned Evans families, tracing to many of the late Evans’ good horses. According to Evans’ former farm manager Chris Baker, who has been reunited with Quiet Giant at Three Chimneys Farm, she was light framed, gangly and immature as a young horse, and as a result, got a late start. She won all her races by huge margins and twice ran 3 3/4 Ragozin numbers, which were fast enough to win most grade I filly races. She has matured into a very attractive scopy mare, and Gun Runner always acted like a sensible, classy colt, who never got sick and always kept out of trouble. Even now, he remains a classy horse in every sense of the word and that is reflected in his ability on the track, where he has developed into an exceptional athlete. The question with him now, in addition to improving on his speed figures, is how he’ll perform off a six-week layoff and doing something no horse in history has ever done – win the Kentucky Derby straight from the Louisiana Derby. What a day for owner Sol Kumin, who saw My Man Sam, owned by his Sheep Pond Partners, close like a rocket to finish second in the Blue Grass and earn a spot in the Kentucky Derby and then watched Exaggerator, in whom he owns 20% for His Head of Plains Partners, romp in the Santa Anita Derby. He was training so impressively as a youngster at Stonestreet Farm he was purchased privately right off the farm, with breeder Jay Bligh keeping 25 percent and Kumin’s elementary school buddy, who races under Newport Stables, taking 25 percent. One small twist, he was purchased strictly as a grass horse. It took Chad Brown a while to warm up to him, but when he did he insisted he was a dirt horse by the way he moved. What first impressed me about My Man Sam was the long powerful and sustained run he put in finishing second in an Aqueduct allowance race to Matt King Coal. Shipping to Keeneland for the Blue Grass instead of staying home for the Wood, he drew post 14, and, despite the post, was able to duplicate that huge run by slicing through the field from 13th on the far turn, being forced to swing seven-wide at the top of the stretch, and then closing fastest of all to nail Cherry Wine for second. What made this performance so impressive was that he ran down a horse who himself was closing fast from the back of the pack. That is the sign of a true powerful closer. So often we see horses run down speed horses or stalkers and you never know if one is really closing or the other is coming back to him. Cherry Wine was coming home powerfully and My Man Sam still ran him down with a :12 2/5 final eighth. This colt is still improving and the male influences in his female family go from broodmare sire Arch to Smart Strike to Storm Bird to Forli, so plenty of stamina there. His dam is a half-sister to Dixie and Jersey Derby winner Hudson Steele and his fourth dam is a half-sister to grade I Ladies Handicap winner Ida Delia and grade II Las Palmas Handicap winner Nikishka. So there is a good combination of grass and dirt in his pedigree. I was seriously considering dropping him off the list and waiting until we saw what he did in the Arkansas Derby, because he currently sits at No. 32 on the Kentucky Derby leaderboard and needs a second-place finish to secure a spot in the field. But I couldn’t do it. I just like everything about this horse and will bank on him running big, even though nothing this year surprises me anymore. I also love his pedigree. But it won’t be easy if he’s going to drop as far back as he did in the Southwest and Rebel Stakes. It all depends on his post again, and I see him running closer to the pace this time. He tuned up for the race with a solid half-mile work in :48 2/5. We know he can place himself anywhere in a race and can come inside, between, and around horses. But with such a large, competitive field expected for the Arkansas Derby he’s going to have to have luck on his side as well. I was also considering dropping him for the same reasons as Suddenbreakingnews. But as mentioned earlier, his Thoro-Graph figure for the Rebel was more than three points faster than the victorious Cupid, which gives you an indication just how much ground he lost throughout the race. So, perhaps it wasn’t the distance or a lack of a killer instinct that got him beat in his last two starts, as some might suggest. With 24 points, he is No. 24 on the Derby leader board, and needs only a third or possibly fourth-place finish in the Arkansas Derby to earn his spot in the Kentucky Derby. He breezed a half in :48 4/5 and looks to be sitting on a breakout performance if he gets a good trip and can save some ground for a change, especially with Irad Ortiz Jr. knowing him a lot better now after riding him for the first time in the Rebel Stakes. He is another whose distance capabilities have been questioned, because of the nature of his two defeats and his big effort at six furlongs in January, so this will tell us a lot about him and where he fits in the Kentucky Derby picture. He has shown on more than one occasion he has an explosive turn of foot. Ortiz just has to know when to pull the trigger. Just a side note about OUTWORK’S slow time in the Wood. Slow times in general don’t bother me if I already know the horse is fast. Better too slow in the final prep than too fast. On a track like that, and for such an inexperienced horse, I can overlook time, because I have seen the best of them run slow final preps before winning the Kentucky Derby. Northern Dancer won the Flamingo in a swift 1:47 4/5. But when he won the Florida Derby in a lethargic 1:50 4/5, Bill Shoemaker took off him to ride Hill Rise. He then ran another slow race in the Blue Grass, in 1:49 4/5, and went on to run the fastest Kentucky Derby of all time. Seattle Slew won his first start at seven furlongs in a track record 1:20 3/5, the won the Flamingo in a blazing 1:47 2/5. Therefore, many people were disappointed to see him win the Wood Memorial in workmanlike fashion in a slow 1:49 3/5. Swale won the Florida Derby in a swift 1:47 3/5, but in the Lexington Stakes in the slop, he was beaten eight lengths, with the winner running the 1 1/16 miles in a sluggish 1:45 2/5. Spectacular Bid won the Hutcheson Stakes in 1:21 2/5 and was a very fast 2-year-old and won the Flamingo and Florida Derby easily in solid time. Just when everyone was expecting a monster effort in the Blue Grass Stakes, Bid easily defeated three overmatched opponents, but ran the 1 1/8 miles in a pedestrian 1:50. Street Sense set a track record winning the Tampa Bay Derby and then was beaten a nose in the Blue Grass Stakes in a plodding 1:51 1/5. So, with Outwork having already pushed Destin to a track record in the Tampa Bay Derby (his time would have equaled Street Sense’s track record), I can forgive a slow time in the Wood over a deep tiring muddy track. It is what he got out of the race that is more important. There’s no denying it. The California horses simply look better than the Eastern horses. Just look at TROJAN NATION’S surprising second-place finish, beaten a head, in the Wood Memorial at 81-1, and even LAOBAN ran a big race in the Blue Grass Stakes, setting some wicked early fractions and still finished fourth at 20-1, beaten only 4 3/4 lengths. And both these horses are maidens. The last maiden to run in the Kentucky Derby was Nationalore in 1998. Triple Crown winner Sir Barton actually was a maiden when he won the Kentucky Derby. The last maiden to win the Derby was Col E.R. Bradley’s Broker’s Tip in 1933. Of the nine maidens who have competed in the Derby since, the best finish was eighth. I wouldn’t have a clue where to rank Trojan Nation or where he fits in the Derby picture. He does have an excellent pedigree and the Rasmussen Factor (RF), being inbred to Natalma through her son Northern Dancer and daughter Raise the Standard. Despite his head defeat in the Wood Memorial, he is a total unknown, although he did have a well-beaten third behind Cupid two races back and his connections did ship him cross-country to run in this race after he turned in a bullet 5-furlong work in :59 4/5, fastest of 59 works at the distance. You don’t see too many maidens with a bullet work at Santa Anita, especially with 58 other horses working at the same distance. Just look at horses like him and MAJESTO, who came off a so-so maiden win to finish second to champion Nyquist in the Florida Derby and earn a spot in the Kentucky Derby. You just never know when young 3-year-olds are going to burst on the scene from out of nowhere. I actually don’t feel SHAGAF ran as bad a race in the Wood as most people think, considering the trip he had from the rail, dropping far back, always looking for running room, and never really getting a clear or a clean run. Just after the start, Adventist came over on him, knocking him off stride slightly, causing him to turn his head in, just enough for him to lose contact with the field. He actually had to run his second quarter in about :23 1/5, while some 8-10 lengths off the pace, which is not how he wants to run. He should have been sitting right off Outwork’s flank at that point. He showed good acceleration going into the far turn to quickly close in on the field, only to run into a wall of horses and lose all momentum. After having to pause, he got in gear once again and closed in on the leaders, but had to squeeze his way inside Tale of S’avall, bumping with him. He finished steadily, but had done too much on that track and no doubt got tired, switching over to his left lead before the wire. The muddy track obviously didn’t help him at all, being stuck behind horses, but he tried hard. He was only beaten four lengths, and I can easily see a vastly improved performance stretching out to 1 1/4 miles on a fast track. Many have given up on him, and speed figure-wise, he still looks too slow to be competitive in the Derby, but stranger things have happened, and with his pedigree, the look of class about him, and his overall record, it wouldn’t shock me if he surpassed expectations in the Derby. Although I had to drop either MO TOM, SUDDENBREAKINGNEWS, or WHITMORE to make room for some of last weekend’s heroes, I felt I should keep the last two and give them a chance to see what they can do in Saturday’s Arkansas Derby. That doesn’t mean I think any less of Mo Tom, who could hop back on if these two don’t run big. There is also CHERRY WINE and ADVENTIST, who could have been added to the Top 12. Both these colts turned in excellent efforts, and I particularly loved the way Adventist ran at the end after appearing rank and throwing his head around early and then basically spinning his wheels and going nowhere in the mud. But he did level off in the final furlong and closed fast, although the :14 final eighth obviously made him look like he was closing faster than he really was. Still, he is an improving colt with a strong pedigree. The problem with Cherry Wine is that he is No. 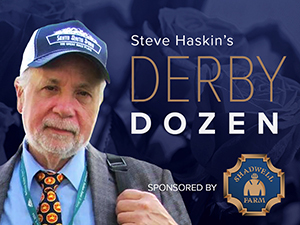 23 on the Derby leaderboard and there are good horses like Suddenbreakingnews, Whitmore, CREATOR, DISCREETNESS, and DAZZLING GEM behind him looking to leapfrog him in the Arkansas Derby and get into the Top 20. Even UNCLE LINO, who ran a strong third in the Santa Anita Derby after chasing that blazing pace set by Danzing Candy is ahead of him at No. 22, and the aforementioned Laoban is at 21. So, Cherry Wine, despite his big effort at Keeneland, is not assured of a starting berth at this time. He deserves to be in the Derby, which makes it that much tougher to lose that place spot in the final jump. Cherry Wine’s pedigree is loaded with major slop influences, so it would have been interesting to see what he would have done in the Wood Memorial, especially with that :14 final eighth. Speaking of Cherry Wine and Mo Tom, this has not been the best of times for Corey Lanerie, whose brain freeze aboard Mo Tom in the Louisiana Derby has been widely publicized. Lanerie also has been the regular rider of Brody’s Cause and Cherry Wine, and guess which horse he rode in the Blue Grass Stakes? Now, having given up the mount on the Blue Grass winner, he has to decide whether to ride Cherry Wine or Mo Tom in the Kentucky Derby. He was certain he’d be taken off Mo Tom, but trainer Tom Amoss left him on. Will he now take off that horse to ride Cherry Wine, assuming he gets in the race? He has to be hoping Amoss and/or Romans don’t ask him for a commitment now. Imagine choosing Cherry Wine and having him not get in the race and winding up with nothing? Getting back to the Santa Anita Derby. DANZING CANDY was a big disappointment, not only because he was beaten over 13 lengths, but that he was pushed out of the gate to get the lead and then proceeded to set suicidal fractions. So instead of using the Santa Anita Derby as a prep and learning experience and an attempt to show he can rate, they got just the opposite and now have a one-dimensional speed horse who doesn’t know what the word relax means. That’s not the way you want to try to win the Derby unless you can run a freaky race like Spend a Buck, who was allowed to open a huge lead and had the ability and stamina to keep going. UNCLE LINO probably isn’t ready for the Derby, but he is a very good horse who is going to win his share of stakes during his career. The other disappointment in the Blue Grass was ZULU, who was never in the race and staggered home in 12th, beaten nearly 24 lengths. It was odd seeing him with blinkers after only three starts and a good second to Mohaymen, but that likely was not the reason why he ran as poorly as he did. Remember when AMERICAN DUBAI was being highly regarded after his excellent third in the Southwest Stakes? Well, he has totally unraveled with two absolutely dismal performances. Dale Romans, who has a top contender in Brody’s Cause and another serious horse in Cherry Wine if he gets in, may not be finished yet. Don’t overlook UNBRIDLED OUTLAW in the Arkansas Derby. He returned in an allowance race at Oaklawn after suffering a setback last fall and ran an excellent race, finishing second to older horses after setting a brisk pace. It was an encouraging first start back and he could break out with a big performance on Saturday. Also on the Arkansas Derby front, DAZZLING GEM got the green light after breezing a half in :49 2/5. CREATOR breezed his half in :50 2/5. In other works, TOM’S READY turned for the Kentucky Derby with a sharp half-mile breeze in a bullet :47 3/5, fastest of nine works at the distance. Haven’t seen or heard a peep from the LANI camp. Last I saw he was galloping last week in the dark at Churchill. Could be a lost in translation situation. For those wondering, I haven’t forgotten him. To show how difficult it is getting a horse to the Derby, Todd Pletcher had nine promising talented horses on the Derby trail, and it looks as if he will get two of them there – Destin and Outwork, and possibly three if Gettysburg upsets the Arkansas Derby. And Destin never ran in a final prep. Those who didn’t make it are Zulu, Donegal Moon, Cards of Stone, Rally Cry, Mo Power, and possibly Gettysburg if he runs poorly. And Azar would need a number of defections to get in the race. Well, I have to admit, looking back at my first Derby Dozen on Jan. 19, my No. 1 horse, Greenpointcrusader was a bust, thanks to a bizarre racing and training schedule. But he’s never been heard from since the Louisiana Derby, so perhaps he didn’t come out of that race too well. However, as wrong as I was with him and his path to the Derby, I have to feel good about my original Top 5 as a whole. My No. 2 horse, Brody’s Cause, won the Blue Grass Stakes; my No. 3 horse, Mohaymen, won the Fountain of Youth; my No. 4 horse, Nyquist, won the Florida Derby; and my No. 5 horse, Exaggerator, won the Santa Anita Derby. Mor Spirit was at No. 7 and Mo Tom at No. 11; I won’t even bother mentioning the others, they were such flops. But the bottom line is I still don’t have the slightest idea who is going to win the Kentucky Derby.